Friday Dance Schedule Free beginner-friendly lesson: 7:30 to 8 p.m.
Contra dance: 8 to 11 p.m. • Free refreshments at 9:30 p.m. Saturday Dance Schedule Free beginner-friendly lesson: 7 to 7:30 p.m. Sat, Apr. 13 Anne's Birthday Bash • Details below FREE! San Diego Contra Dance is an inclusive dance community committed to providing a safe and enjoyable environment for everyone. To that end, we have published some guidelines as to proper conduct at a contra dance, as well as guidelines for contra dance etiquette. Please take some time to read these two documents, and do your part to ensure the safety and comfort of all dancers in attendance. 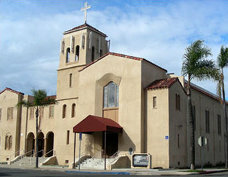 Our dances take place in the hall of Trinity United Methodist Church (pictured), located at 3030 Thorn Street, San Diego 92104, on the northwest corner of Thorn and Grim Avenue. From the north: Take Exit 15, marked "North Park Way / University Avenue," from the southbound I-805. Stay on the left side of the fork in the offramp, and continue west on North Park Way for two blocks until you reach 32nd Street. Turn left on 32nd Street, and continue south for five blocks to Thorn Street. Turn right on Thorn Street, and go three blocks to the intersection of Thorn Street and Grim Avenue. Destination will be to your right, on the northwest corner. From the south: Take Exit 15, University Avenue, from the northbound I-805. Turn left on University Avenue, and proceed west for some four to five blocks to 32nd Street. Turn left on 32nd Street, and continue south for six blocks to Thorn Street. Turn right on Thorn Street, and go three blocks to the intersection of Thorn Street and Grim Avenue. Destination will be to your right, on the northwest corner. For general inquiries, write us at sdfhcontradance@gmail.com, or click the outgoing-email icon at left. (You can also use the email icons at the top and bottom of every page of this website.) Please address regular mail and packages to San Diego Contra Dance, P.O. Box 270562, San Diego, CA 92198. Want to be on our mailing list? For those who wish to be apprised of upcoming dances, we maintain a mailing list for distributing weekly dance announcements. To subscribe to these announcements, just email us and let us know—or click the incoming-email icon at left. Rest assured that we do not send anything other than our dance announcement each week, and your email address will never be shared with any other individual, group, or organization.